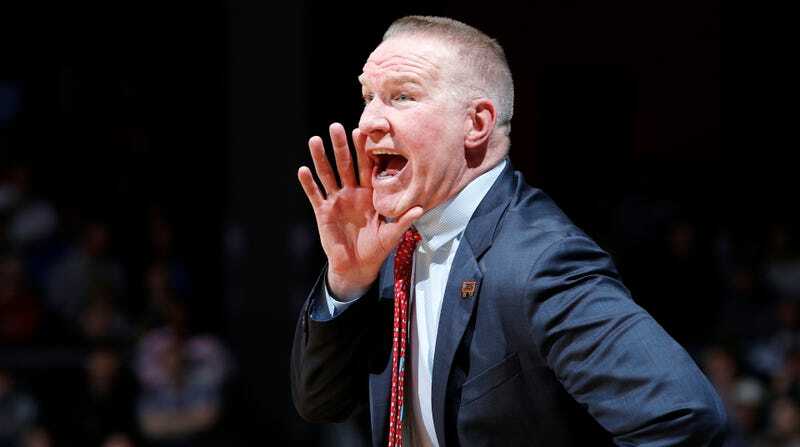 Today, Chris Mullin announced that he was stepping down as St. John’s basketball coach after four seasons at the helm. Jon Rothstein first broke the news that Mullin was leaving last night. Mullin cited “a recent personal loss” in his resignation statement (his older brother died of cancer in March), and he will leave the Red Storm with two years and $4 million left on his contract. He will reportedly be bought out of his deal. Mullin never lived up to expectations in Queens, going just 20-52 in Big East play and never advancing past the First Four of the NCAA Tournament. However, last year, the Red Storm won 21 games—tied for the most since 1999-2000—and reached the postseason for the first time in Mullin’s tenure. His lackluster record in conference play is certainly a factor in his departure, though a rift within the St. John’s athletic department seems to have been just as impactful. The rift reportedly opened up last summer, when Mullin wanted to hire disgraced former Rutgers coach Mike Rice as an assistant. School president Bobby Gempesaw turned him down, fearing a PR shitstorm for St. John’s. Gempesaw, who was the force behind Mullin getting the job in the first place, then hired athletic director Mike Cragg last September. For the first time in Mullin’s tenure at St. John’s, he had to answer to someone else besides Gempesaw. Abdelmassih did the heavy lifting, recruiting virtually the entire roster. There were questions about the rest of the staff’s work ethic in recruiting, and the need to have more than one primary recruiter. Mullin wasn’t seen as much as other head coaches on the recruiting trail in recent years and didn’t have a high school recruit signed for next year. Mullin obviously was not given his extension, and rumors that he would leave began piling up last week. Cragg attempted to squash them by putting out a statement declaring the school’s support for Mullin three days before Mullin would eventually leave. According to a source, Rick Pitino reached out to the school on Monday expressing interest if the job opened up.